Town attacker Elliot Lee is thrilled that his move to the tip of the diamond hasn’t for a second blunted his striker’s instincts this season. Lee, who has been mainly categorised as an out and out forward during his career, dropped back to play just behind the front two in the latter stages of last term. I’m really enjoying it at the minute and I think my striker’s instinct is really coming into play in the number 10 role. It’s a role he looked well equipped in, and has carried that on this term to great effect. 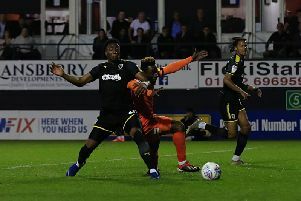 His two strikes in the 3-1 over Gillingham on Saturday took him to eight for the season, as he managed another brace against Bradford in midweek to move to 10, while the manner in which he scored them at the weekend was especially pleasing, both from in and around the six yard box. “I can play in the 10, I don’t have to get across the near post like some strikers have to, I can linger and look for the cut back and do my own thing. The former West Ham forward’s first goal saw him adjust his feet quickly to prod home James Collins’ low cross via the underside of the bar. On the strike, he said: “I think he owed me that one from the weekend when I gave him his hat-trick (against Plymouth), so I just stood my ground in the box. “It’s brilliant from Collo, he’s picked me out and I’ve put it away. “I had one the other week against Wycombe where Matty (Pearson) scuffed a shot from a corner and I connected with it wrong, so that was going through my head. Lee’s second was then created entirely by a magnificent run from Harry Cornick, the forward hurtling a full 70 yards, outpacing two opponents with ease, before bearing down on keeper Tomas Holy. It looked like he would grab the glory himself, with Lee celebrating as Cornick’s low shot beat the keeper. However, it hit the inside of the post, leaving Town’s number 10 to tap the rebound in, saying afterwards: “The second goal I owe all to Harry Cornick, what a run! “I was in amazement watching him run and then it hit the post, I was actually celebrating before and then I had to put the ball in the back of the net, so all credit to Corns for my second goal. “That’s what he’s capable of though. When the first one got tight to him, I knew he was going to send him on his way and then another one came and I thought he slotted it in. “I was celebrating, fortunately for me, it’s come off the post and I was in the right place at the right time to tuck it home. “Like Shins (Andrew Shinnie), he’s one of my best mates at the club, so it’s great to play with them both and great to see them both doing so well. Lee’s four goal week has lifted him top of the scoring charts as he added: “I think we’re having a little bit of a battle, me, Hylts (Danny Hylton), Collo, Shins is in the mix as well. “It was a great day at the office again. We said it would be tough coming here, but we really wanted to take advantage of the great performance we put in recently, keep the momentum going and that’s what we did.